Macintosh has been the choice of professional photographers for working with digital images. Apple continues this tradition with iPhoto, Snow Leopard’s photography tool for the home user that can help you organize, edit, and even publish your photographs. After you shoot your photos with a digital camera, you can import them into iPhoto, edit them, and publish them. You’re not limited to photos that you take yourself, either; you can edit, publish, and organize all kinds of digital image files. You can even create a photo album and use the iPhoto interface to order a handsome soft- or hard-bound copy shipped to you. Source list: This list of image locations determines which photos iPhoto displays. You can choose to display either your entire image library or just the last “roll” of digital images that you downloaded from your camera. You can create new albums of your own that appear in the Source list; albums make it much easier to organize your photos. Photos can be grouped by Event (when they were taken), Faces (who appears in the photos), and Places (where photos were taken). You can create books, calendars, cards, and slideshows. Viewer: This pane displays the images from the currently selected photo source. 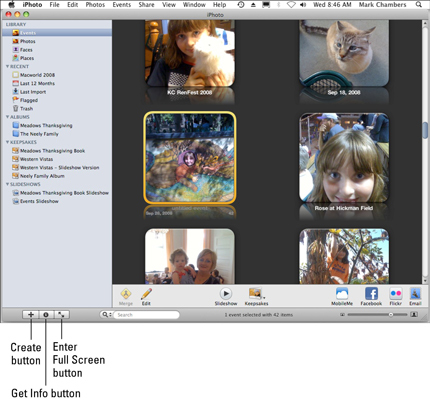 You can drag or click to select photos in the Viewer for further tricks, such as assigning keywords and image editing. Create button: Click this button to add a new blank album, smart album, MobileMe gallery, book, calendar, card, or slideshow to your Source list. Get Info button: Click this button to display information on the currently selected photos. Enter Full Screen button: Click this button to switch to a full-screen display of your photos. In full-screen mode, the images in the selected album appear in a film strip across the top of the screen, and you can click one to view that image using your Mac’s entire screen. Play Slideshow: Select an event, album, book, or slideshow in the Source list (or multiple images you’ve selected in the Viewer) and click this button to start a full-screen slideshow using those images. Search box: Click the button next to the Search text box to locate photos by specific criteria, or just click in the box and start typing to search by description and title. Thumbnail Resize slider: Drag this slider to the left to reduce the size of the thumbnails in the Viewer. This allows you to see more thumbnails at one time, which is a great boon for quick visual searches. Drag the slider to the right to expand the size of the thumbnails, which makes it easier to differentiate details between similar photos in the Viewer.